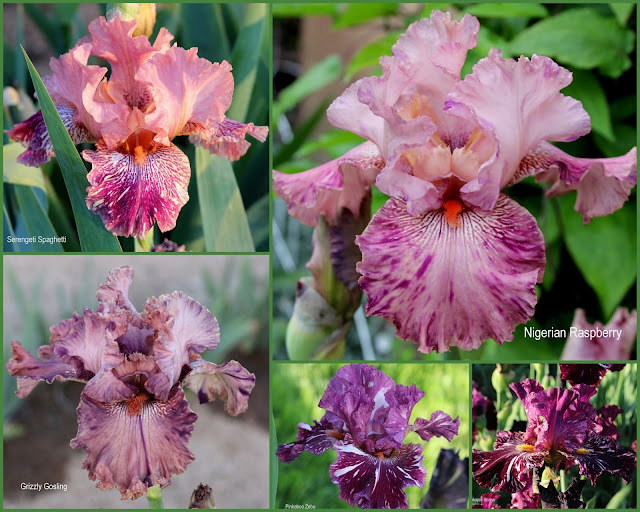 For this post I have some collages and a slide show as a continuation of my last article on how to use photos to extend the iris season. 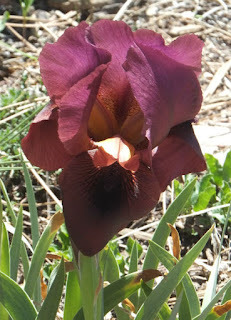 To view my last post click Another Look at Plicata Irises. 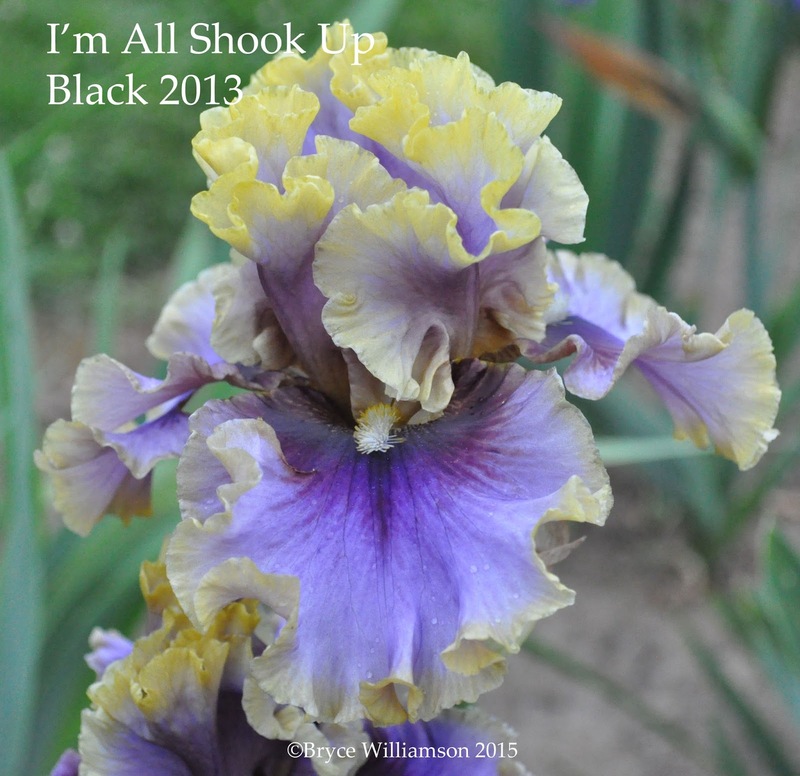 The theme this time is "Broken Color Irises." 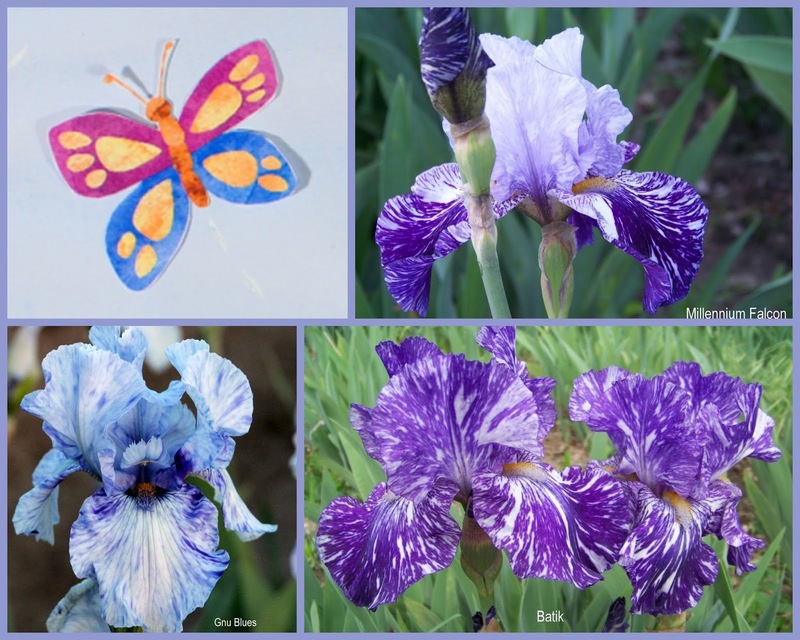 Pictured are 4 collages of irises that are in the slide show at the end. 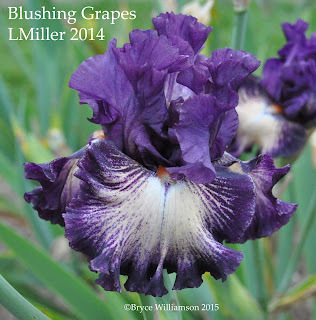 Mike Unser published a great article called Broken Color Iris Terminology in 2012. 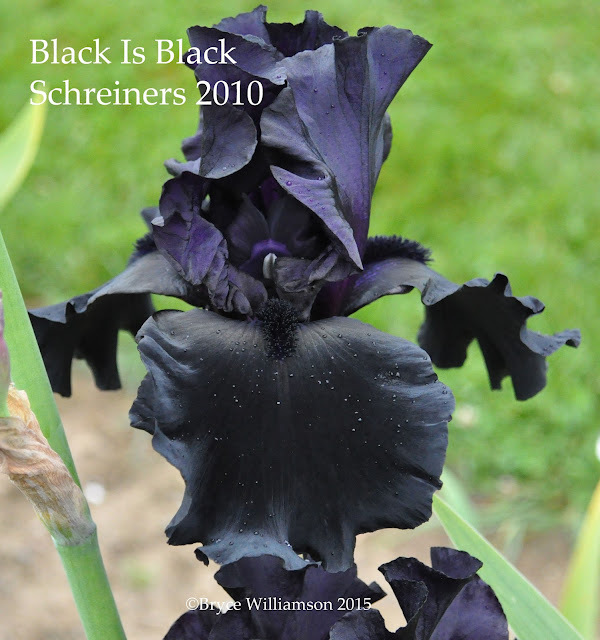 He introduced the article by saying "in color breaking, a genetic instability causes the colors and/or patterns of the iris to express irregularly giving a flower that is splish-splashed [pattern]in a more or less haphazard fashion. 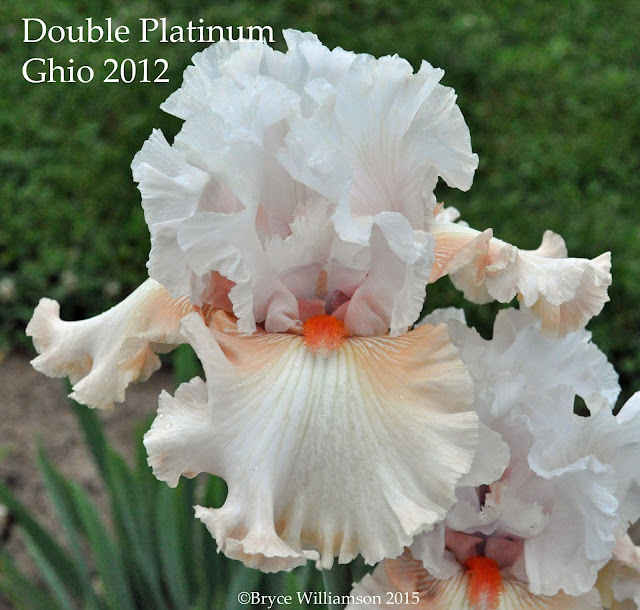 No two blooms are every just alike, and they can create a very lively and exuberant effect in the flower garden." 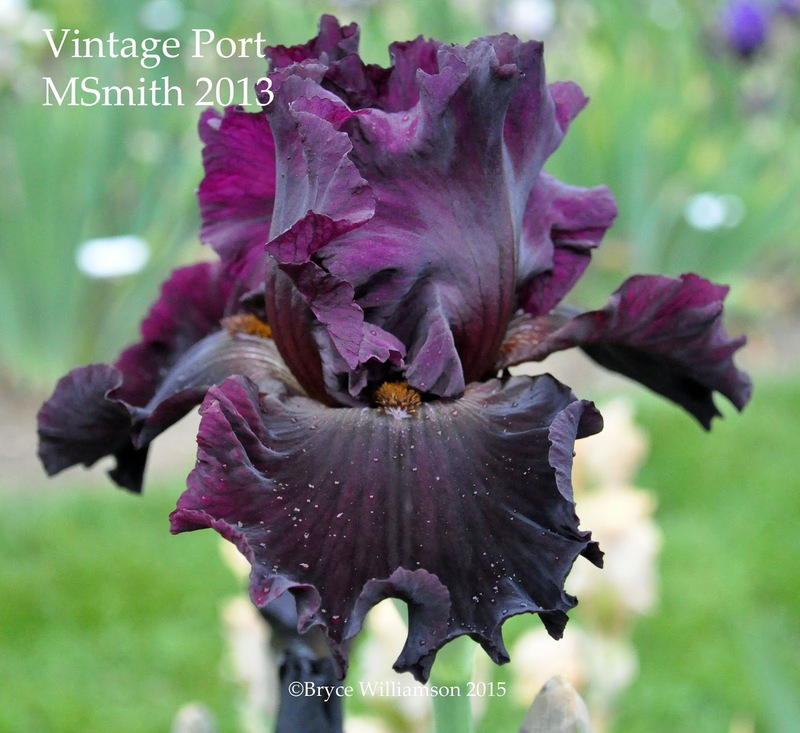 Mike's article included many pictures of older broken color irises, including 'Victorine' from the 1840's, 'Loreley' from 1929, and many others up to Allen Ensminger's 'Batik' in 1985. 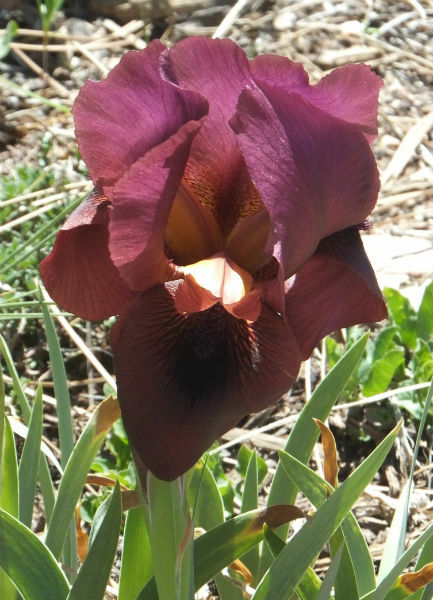 Brad Kasperek is considered the pioneer of the modern broken color irises. 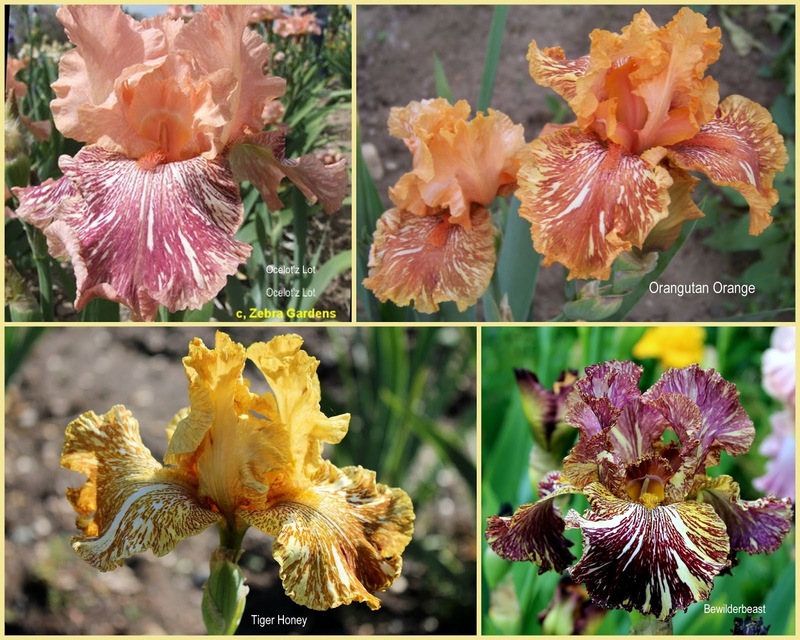 He has been hybridizing broken color irises for 25 years. Brad approves of Mike's definition. He also said that Allen Ensminger was instrumental in his focus on the genetic instability that made broken colors possible. 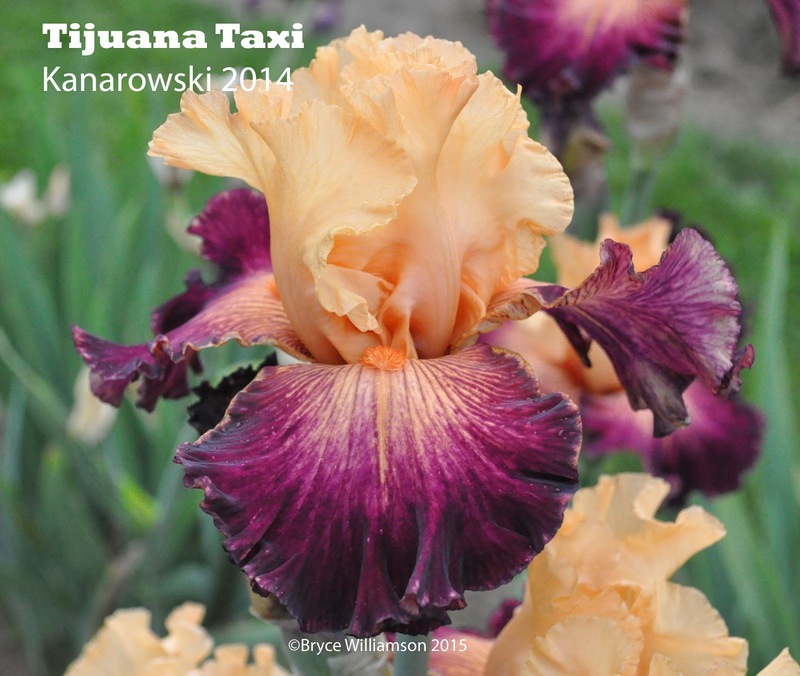 He has hybridized many broken color irises since then and in 2005 was hybridizer of the year. Brad and wife Kathie own and operate Zebra Gardens, located in Elwood, Utah. 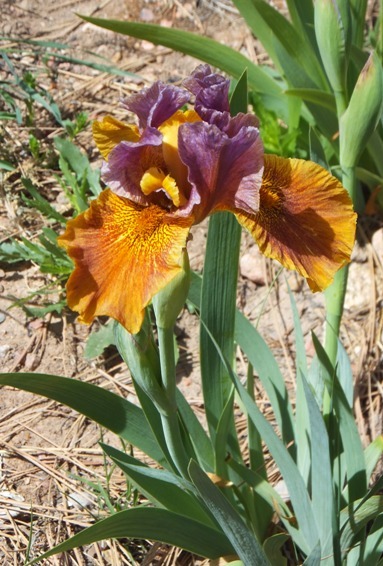 It is just 21 miles north of my garden in Willard, Utah, and most of the broken color irises I grow have come from Zebra Gardens. Susanne Spicker also wrote an excellent article here called Broken color irises with Brad Kasperek in 2013. She visited Brad's Zebra Gardens and took many of the pictures that will be in the slide show today. 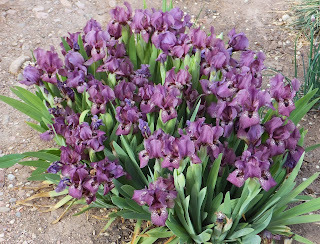 The slide show in this post is similar to my post last time (here is the link to the last post: Another Look at Plicata Irises). 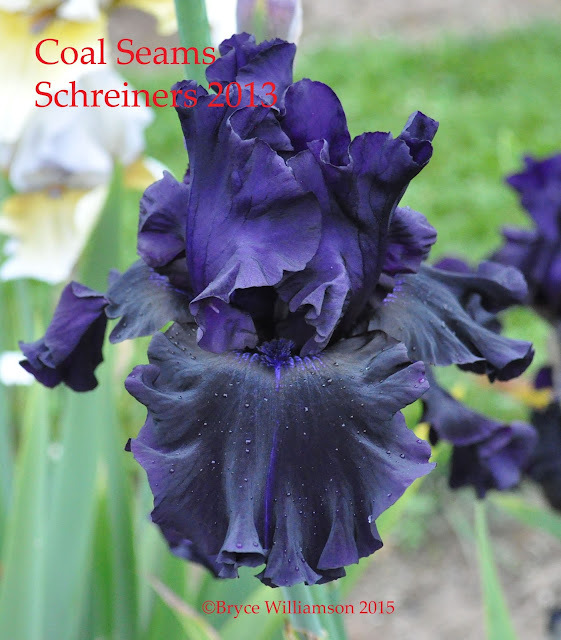 To view the new 3 minute slide show on broken colored irises, click on the button below. 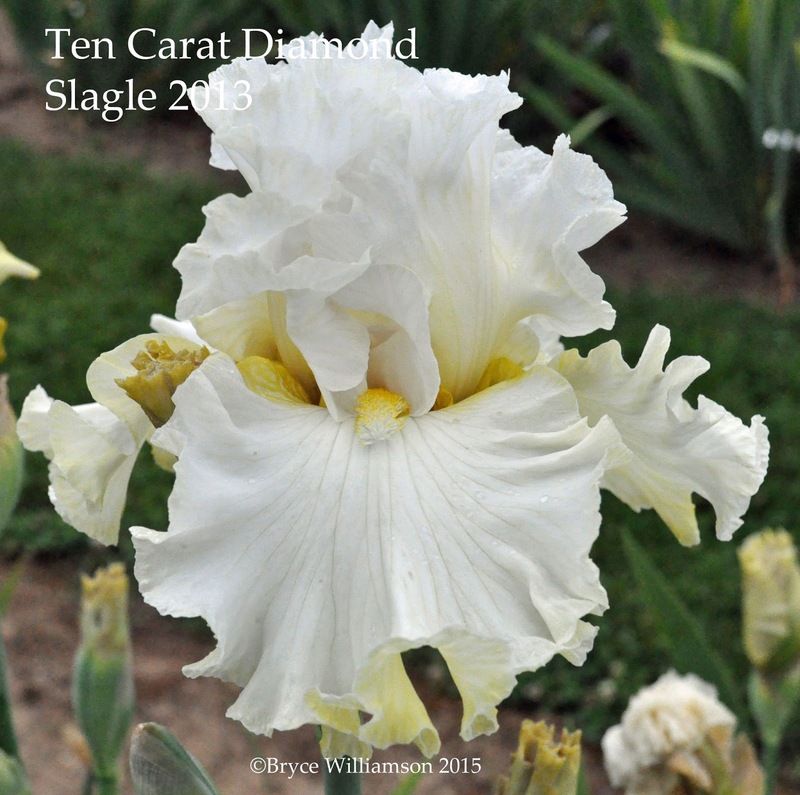 Most irises in the show are tall bearded, but not all. Most I grow in my garden, but a few are on my wish list, since many of my broken color irises are new and I don't have pictures of them yet. Susanne is a close friend, and has been gracious in sharing her photos so that you can see them. While the slide show is loading click on the bottom left button to make the show full screen. It looks like this except yours won't be yellow. 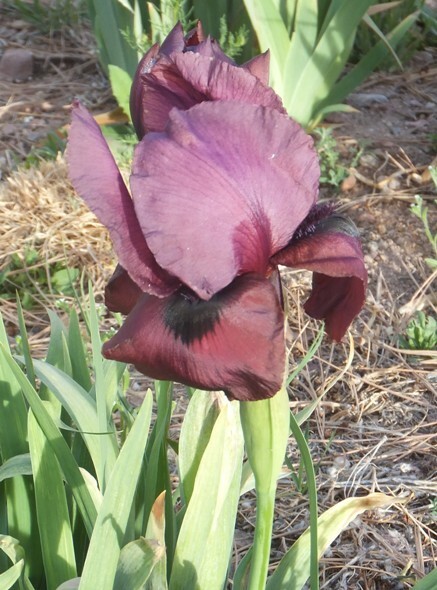 Thanks to Brad Kasperek, Allen Ensiminger and Virginia Messick for your fine skills in hybridizing these beautiful broken color iris. Thanks as well to Susanne Spicker for sharing her pictures. Do you grow any broken color irises? What are your favorites? What other plants or iris do you pair up with your broken color irises? On the scenic drive up the Columbia River Gorge on the bus at the 2015 AIS National, I read that when Chad Harris and Dale Grams moved to what would become Mt. Pleasant Iris Farm they found the fields covered in old growth Himalayan blackberries ranging from 10 to 15 feet deep. The next three years were spent clearing the land. 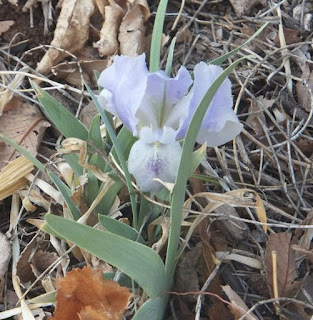 Today no sign of the overgrowth is present and instead, we were greeted with long rows of well grown irises, expanses of manicured lawn, and perennial borders. 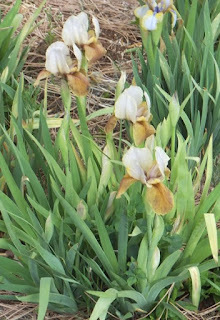 Yes, peak bloom for bearded irises had passed, but after peak bloom the weather had turned cool to cold and damp to wet so there were many irises still in good bloom. In fact, I found the three days of the tour to be the best days I have ever spent taking images since the overcast weather reduced shadows and helped create good quality images. There were a number of tall bearded irises that I saw and liked in this garden over the last two years. Since a picture is worth a thousand words, I will curb my verbosity and let the pictures do the talking. Lynda Miller's Miniature Tall Bearded, 'Moose Tracks', was attracting attention in the guest beds. 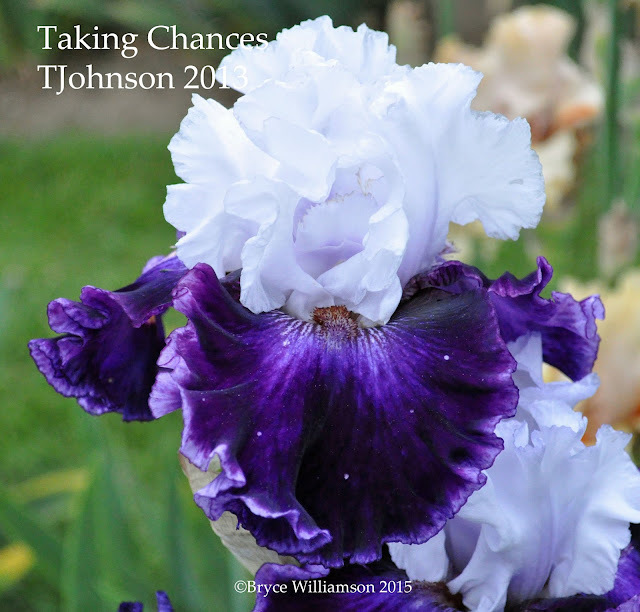 My thanks to Kelly Norris for permission to use his copyrighted image. Moose Tracks would go on and win the Hager Cup at the Awards Banquet on the last night of the convention. I don't know whether to be happy or sad that I live so far away from Mt. Pleasant Iris Farms. There is so much to see from very early in the spring through June that if I lived closer, I would be making a pest of myself and visiting the garden every ten days. On the bucket lists for the future is a trip up to Washington to see the Japanese irises in bloom. Chad wrote that next year the Japanese irises will be blooming on 2 and 3 year clumps and the results should be spectacular. Chad Harris's introductions can be found at two sources: http://www.mtpleasantiris.com and http://aitken-garden.goodsie.com. Images in this blog are copyrighted and cannot be reproduced without permission of the copyright holders Bryce Williamson and Kelly Norris. 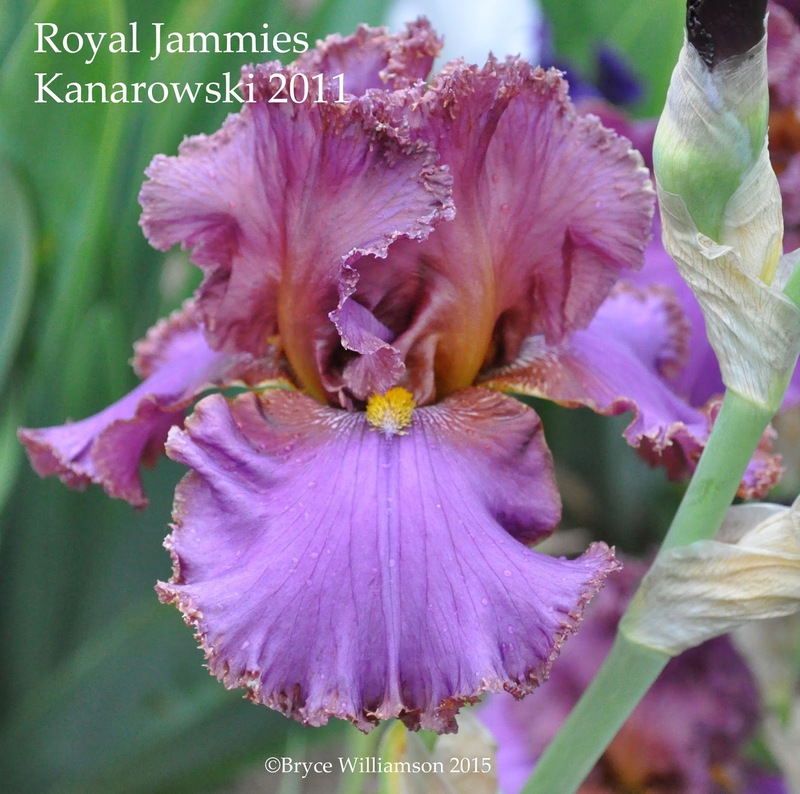 My best blooming iris is 'Total Recall', which is practically an everbloomer here in Southern California. My sentimental favorite is an old NOID (No Identification) that has been on the property for over 60 years, when grandpa used to mow it over every week when he did the grass. 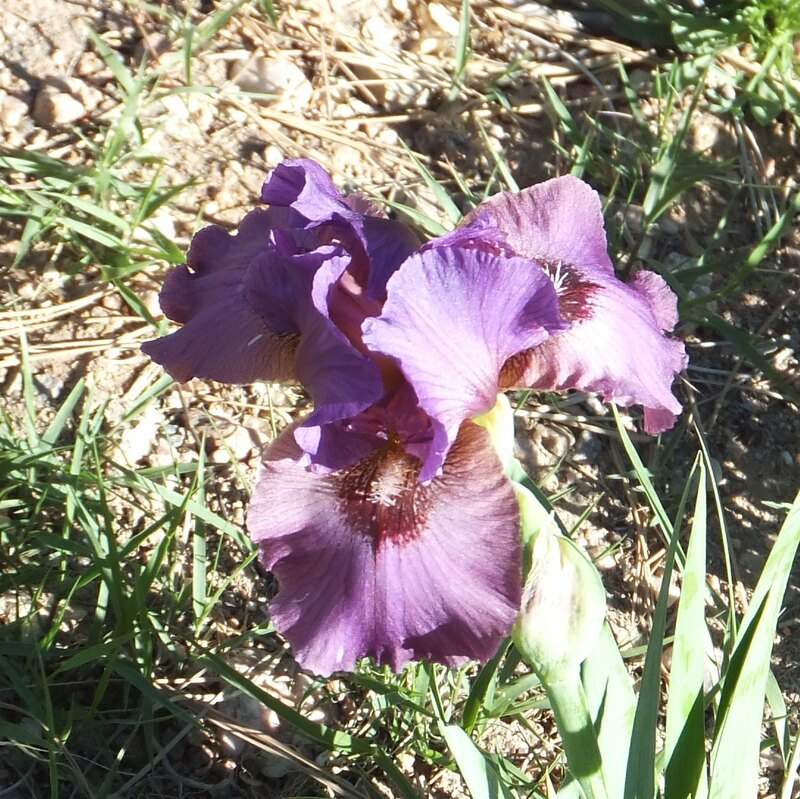 But my prettiest iris, in my opinion, blooms late in the season and generally gets burnt to a crisp from the late May/early June heat. 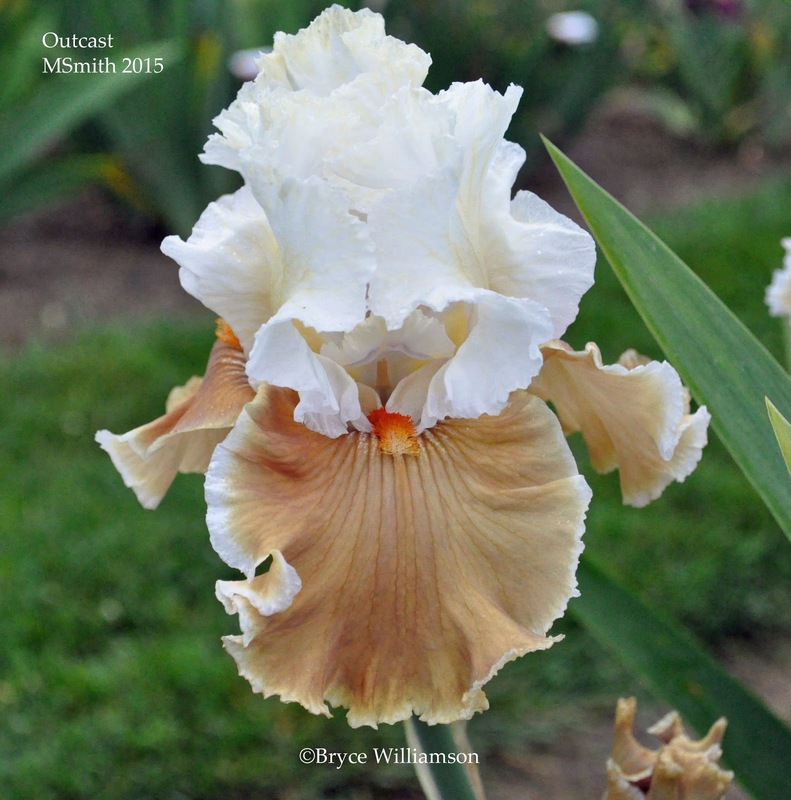 'Cajun Rhythm' (Schreiner, 1996) is a lovely butterscotch orange with a pinkish flush on the midrib and a variable white apron on the falls. I love it with nasturtiums. 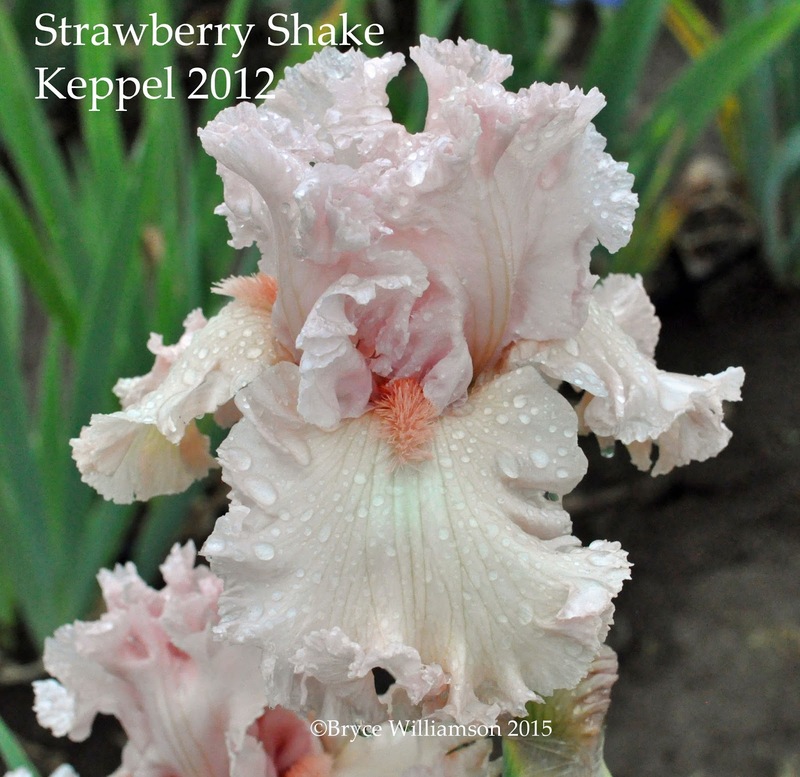 It looks nice with another late bloomer, 'Coral Chalice'. 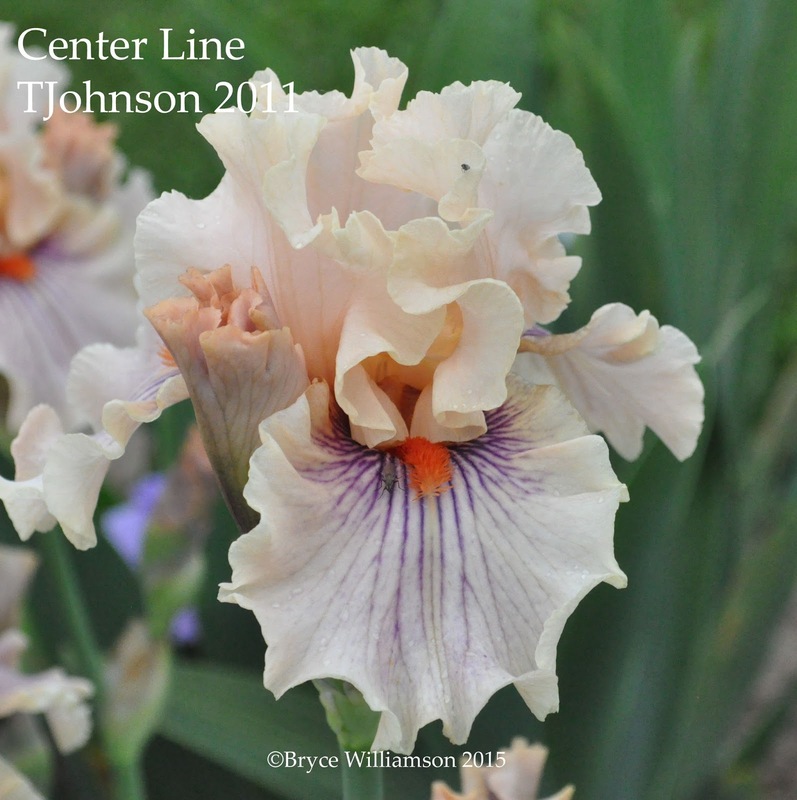 'Tennison Ridge' with 'Cajun Rhythm'. Here it is with 'Double Delight' rose. 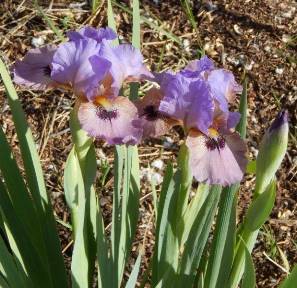 'Cajun Rhythm' is registered as growing to 36" tall, but it is rather short in my garden. The foliage is nice, and does not corkscrew or twist. 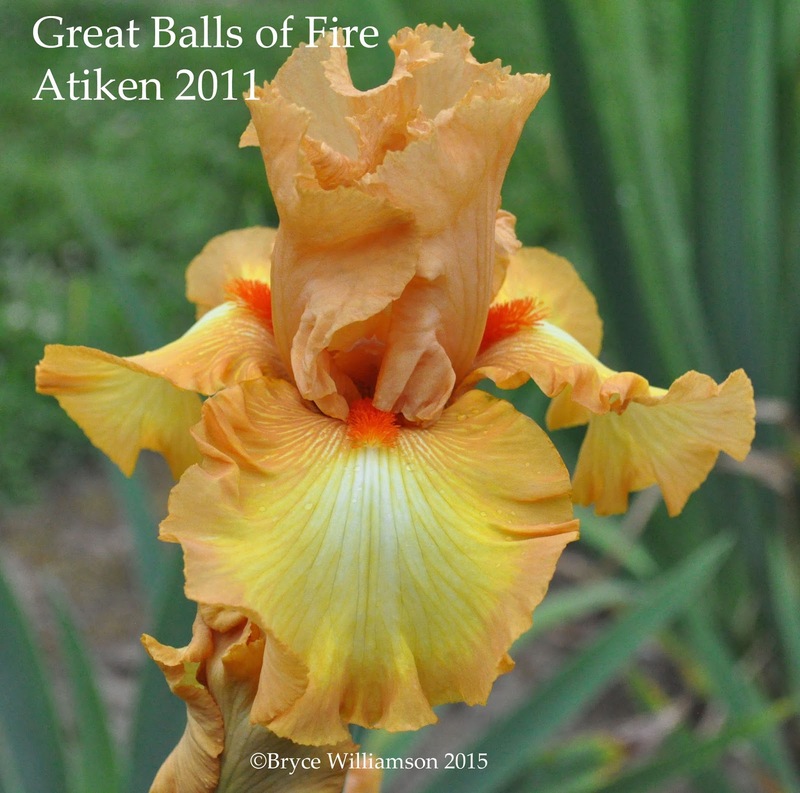 Although it often suffers from the heat here, 'Cajun Rhythm' is so pretty it will always have a place in my garden. While my first blog on this amazing garden focused on Siberian irises, this time I want to highlight some of the other beardless irises growing in the garden that Chad Harris grows and, in two cases, hybridizes. Last year, on my first visit to Mt. Pleasant Iris Farms, I drove up Highway 14 and onto Marble Road to the manicured garden, where I parked in the shade by the barn. 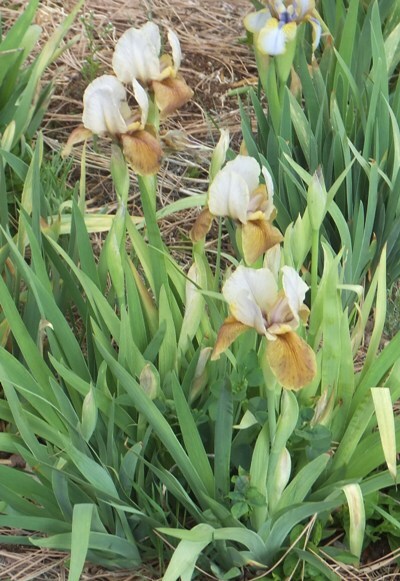 Immediately I was drawn to one of the water features of the garden— a lovely pond with naturalized irises. A spring on the north hillside provides the gravity feed to run sprinklers. Little did I know at that moment that almost 25 years of hard work has gone into this paradise. 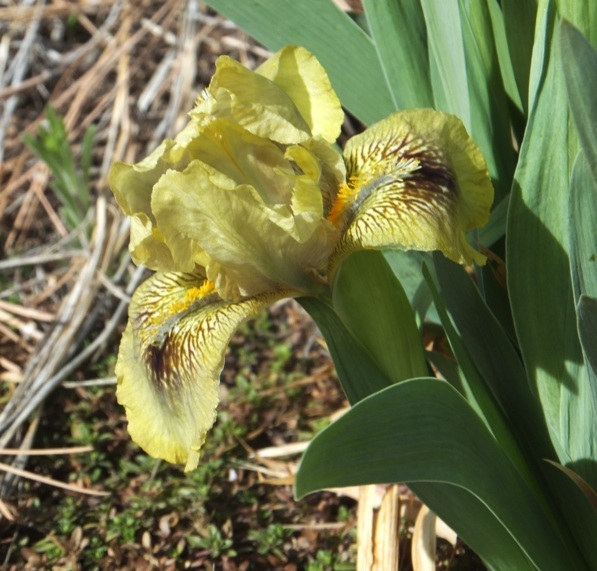 Chad is careful not to plant any water irises that are fertile and might release seeds that would get into the Columbia River Basin ecosystem. 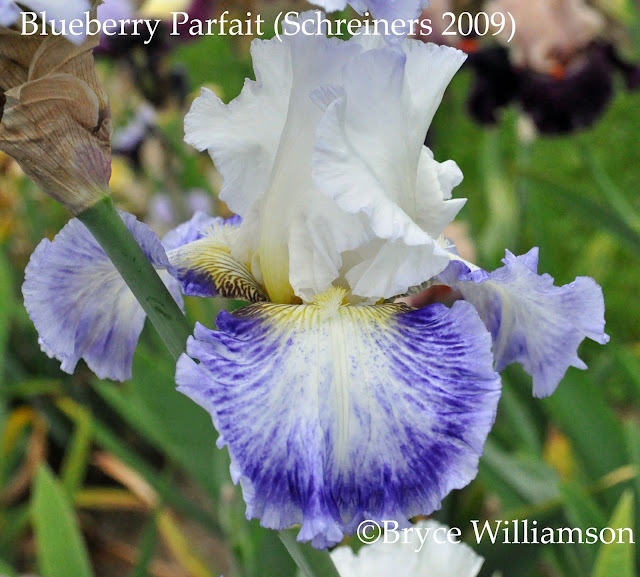 Chad has spent the last 15 years working with Iris laevigata, a native to North East Asia, Russia, and Japan. As the Mt. 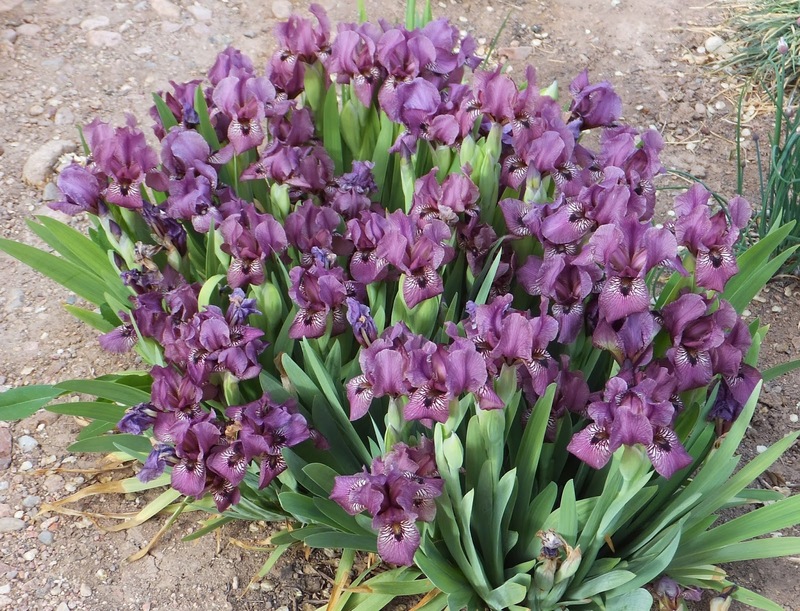 Pleasant catalogue notes, “A true water iris, Iris laevigata will look its best growing in shallow water or a large pot with a deep reservoir filled with water. It can also thrive in a moist to wet setting such as a rain garden." Recently, Chad has also been growing "Pseudata" seedlings. 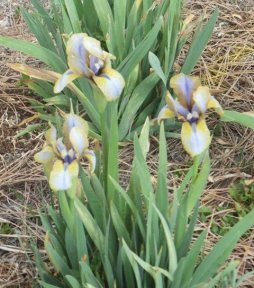 These are, to quote from the catalogue, “a cross between plants with iris pseudacorus backgrounds and iris ensata (Japanese, Hanashobu). 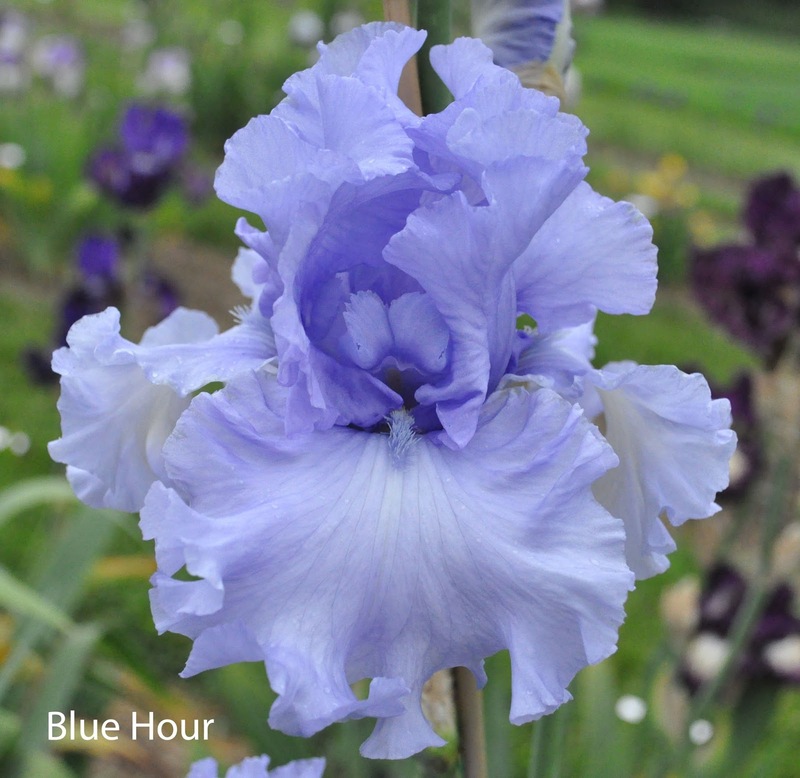 The iris world is very fortunate that Hiroshi Shimizu shared many years of his work; finding a good pod parent ('Gubijin') so all hybridizers could explore the possibilities that this cross may bring to the garden." During the National Convention of The American Iris Society in which this garden was part of the tour, one other interspecies hybrid attracted much attention. In a huge, husky clump, Jill Copeland’s 'Do the Math' was impressive. A surprise in the garden was Phillip Ramare's PC-1. Usually Pacific Coast Natives bloom early, but this nicely colored seedling was still in good bloom. Chad Harris's introductions can be found at two sources: http://www.mtpleasantiris.com and http://aitken-garden.goodsie.com. Both Mt. 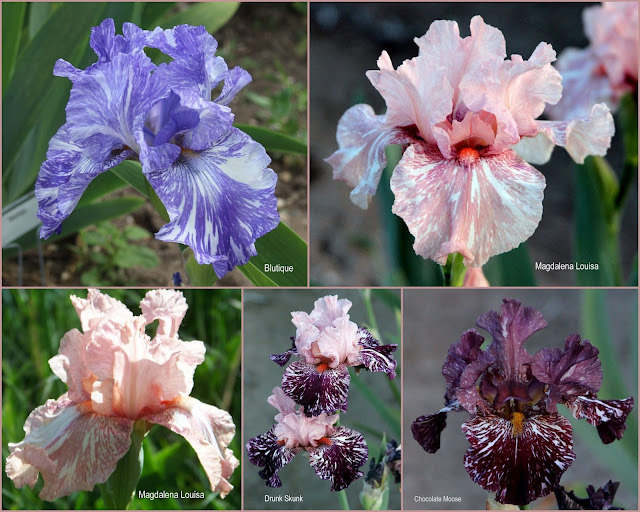 Pleasant Iris Farms and Aitken’s Salmon Creek also carry a wide range of other types of beardless irises. More on Mt. Pleasant Iris Farms to come! Please respect the copyright on these images by Bryce Williamson and Chad Harris.